Where did you spend Saturday July 27th? 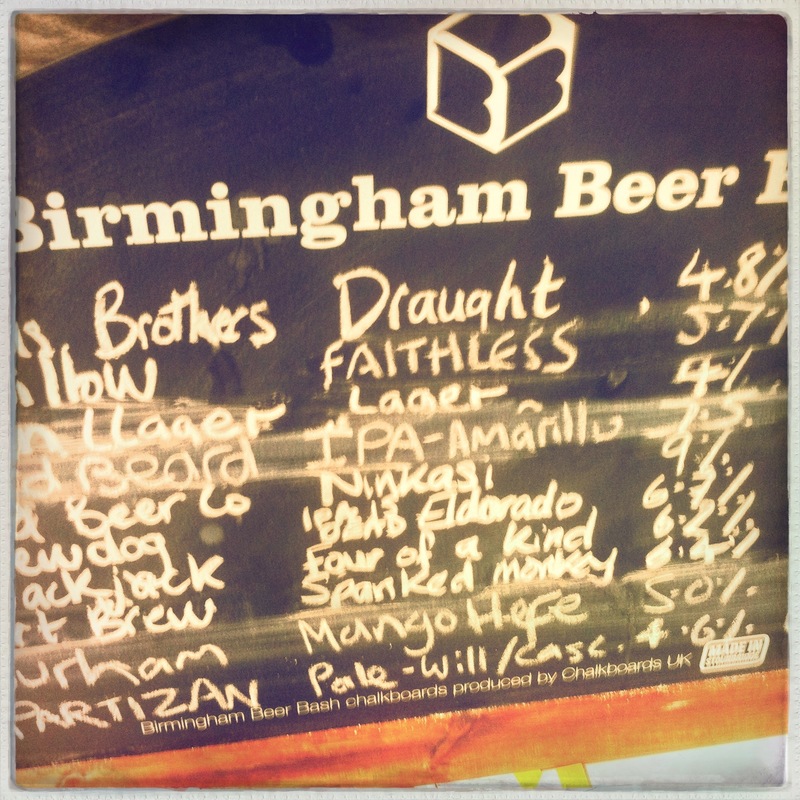 I spent it in Birmingham at an event that I have a feeling will enter local beer folklore. 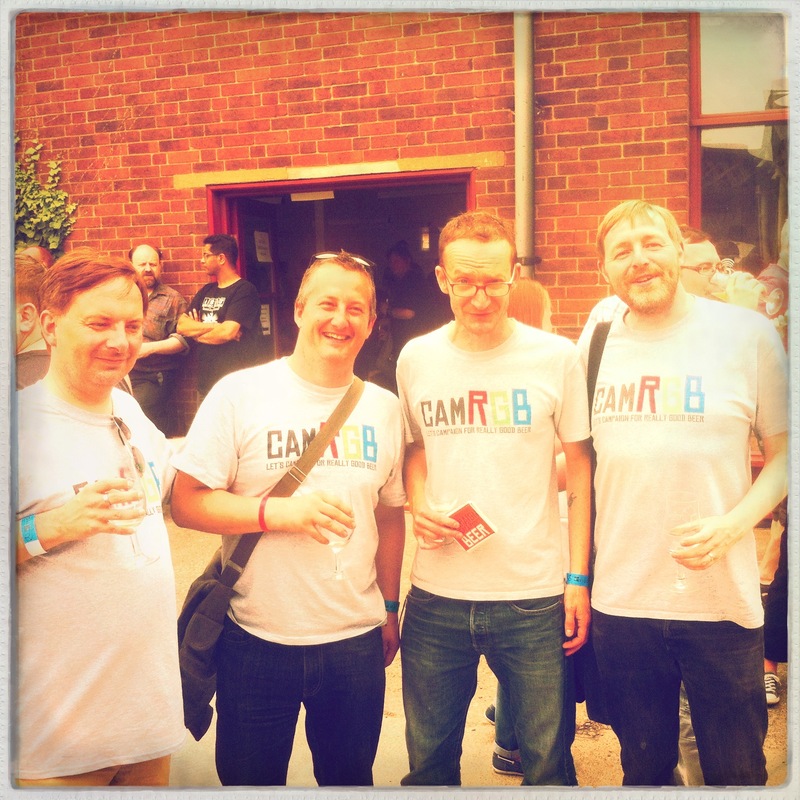 The Birmingham Beer Bash was dreamed up and made flesh by David (@OthertonAleman), Carl (@CarlDurose), Daniel (@mediocre_dan) and Krishan (@StirchleyWines). The Beer Mecca that is Cotteridge Wines in King’s Norton. My day began on a train to Birmingham where I met up with Darren (@circa79pritchy) and Paul (@PaoloFernley) and we caught up on gossip and wondered aloud what the day had in store for us. Our first port of call was Cotterdige Wines in Kings Norton, to meet up with Jaz with whom we were spending the day. 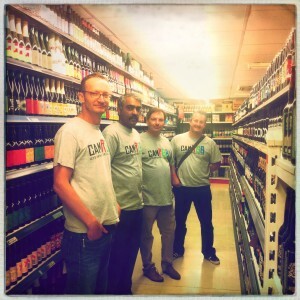 Cotteridge Wines is a little oasis of Really Good Beer hidden in an unassuming shop on a high street in Birmingham and Jaz is himself an unassuming, friendly beer geek of the highest order. It was great to finally catch up with him after all these months of getting to know each other online and buying beer from him. Jaz’s wife (also named Jaz just for confusion’s sake) kindly drove us to the venue. As we got closer I started to feel a little nervous. What if Birmingham Cubed was pants? I wanted so much for it to be a success. From the moment we arrived you could sense the fun, the friendship, the sheer class of the thing. The venue was superb – A central courtyard dotted with some very fine street food stands and a small seating area where revellers basked in the early afternoon sun led to a large hall housing the keg, cask and bottle bars, a smaller room with the international bars and a “fringe events” room, and a small restaurant where some rather fine dining with beer would take place on the Saturday evening. Starting the day with an Anarchist. The buzz of happy chatter filled the air as we wandered into the main hall and plumped for our first drink, a third of Art Brew’s Anarchist Party Bitter (7.2%). It was quite a start but we were all full of excitement and feeling rather brave. 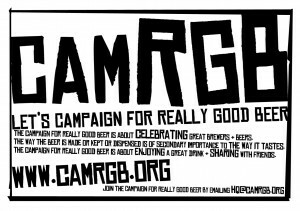 As we drank and I handed out CAMRGB beermats I was stopped several times – something that would happen throughout the day – by people (some of them CAMRGB members, some not) who wanted to say hello, tell me they read the blog, say how brilliant Birmingham Cubed was, and generally have a quick chat about great beer. We wandered across the courtyard and into the international bar where we grabbed a glass of Ska Brewing’s Modus Hoperandi (6.8%) and then went to grab a bite to eat. 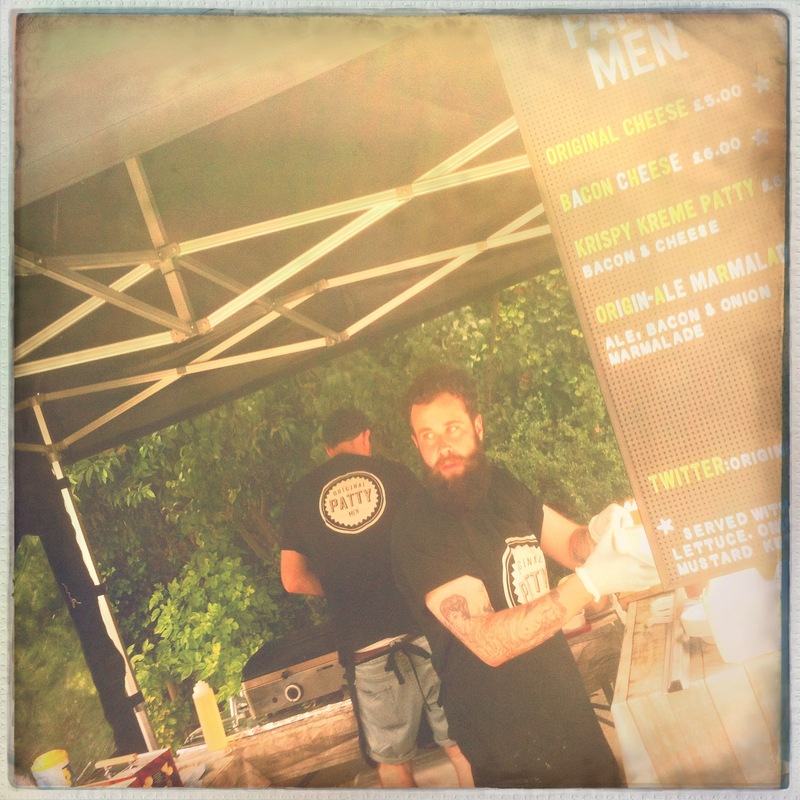 The Original Patty Men 0 Superb burgers and superb beards. We opted for a burger from The Original Patty Men, an award winning street food company from Birmingham. The burger was delicious and as I ate it I was finally introduced to David, former Broadford Brewer and now Head Brewer at The Northern Monk Brew Co.
We chatted as though we’d known each other for ever, which in terms of beer we almost have and just after he wandered off I turned round to see the imposing figure of John from Art Brew. I tried to convince him that after brewing with a christmas tree he should try using other types of wood, perhaps balsa or teak, but he was having none of it. It was also at this time that I made a rather bad (or fine depending on your level of humour) beer geek joke. We were talking about how hops may or may not be related to cannabis and I found myself saying out loud, “Well, you wouldn’t want to smoke them. 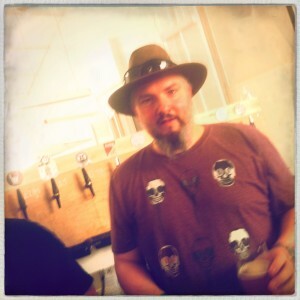 Unless you were making a Smoked Porter,” before apologising profusely and hanging my head in shame. Gregg of Weird Beard and his fine facial furniture. After lunch we continued wandering, more or less doing circuits of the event, bumping into people – Nate (@NateDawg27) and Gregg from Wierd Beard Brewing (@dredpenguin) to name but two. The next beer to try was Harbour Brewing’s Antipodean Rye (5.7%) which while I drank it was my beer of the day, a surprisingly crisp and refreshing beer with just an undercurrent of rye earthiness, but another beer was going to win out in the end and it would be the next one I bought. After chatting with Krishan and David about how well organised and executed the day was, we wandered back into the main hall where I spied Bad Habit (8.5%), a collaboration between Weird Beard Brewing and Northern Monk Brew Co. I couldn’t resist trying this take on a Belgian Tripel and it instantly became the beer of the festival for me. Big and bold, it had a lovely yeasty spiced bread dough aroma, lots of caramel and all spice and a sharp, clean finish. If it hadn’t been so strong I’d have had another glass. To calm things down a bit I opted for a refreshing and thankfully light glass of Liverpool Craft Beer Co’s Beer Bash Pale (4.5%) and had another chat with John and Becky from Art Brew, though not exactly at the same time as they were taking it in turns to leave the site and look after the children. The afternoon was moving on quickly and just as I grabbed a glass of Partizan’s Cascade Willamette Pale Ale (4.6%) I bumped into Marverine (@BeerBeauty) who insisted on pointing an iPad at me and getting me to do a quick interview about my thoughts on the day. Marverine has been a member of CAMRGB for almost as long as it’s existed, and it was good to finally meet face to face, though having seen the footage she shot I think I probably have a face fit for radio rather than the screen. The final drink at Birmingham Cubed was an old favourite, Sierra Nevada’s Pale Ale (5.6%). Yes I know there were so many other beers to try but we’d just been given last orders and rather then waste the last thirty minutes of my time trying to choose, it was easier to grab something good and have one last chat with as many people as I could. 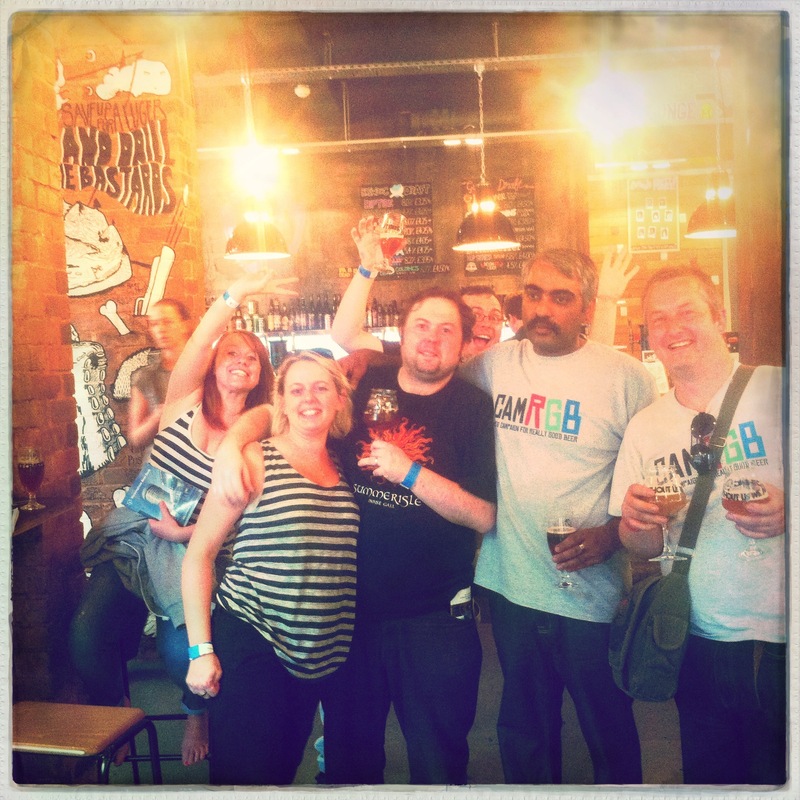 Final drinks in BrewDog Birmingham. 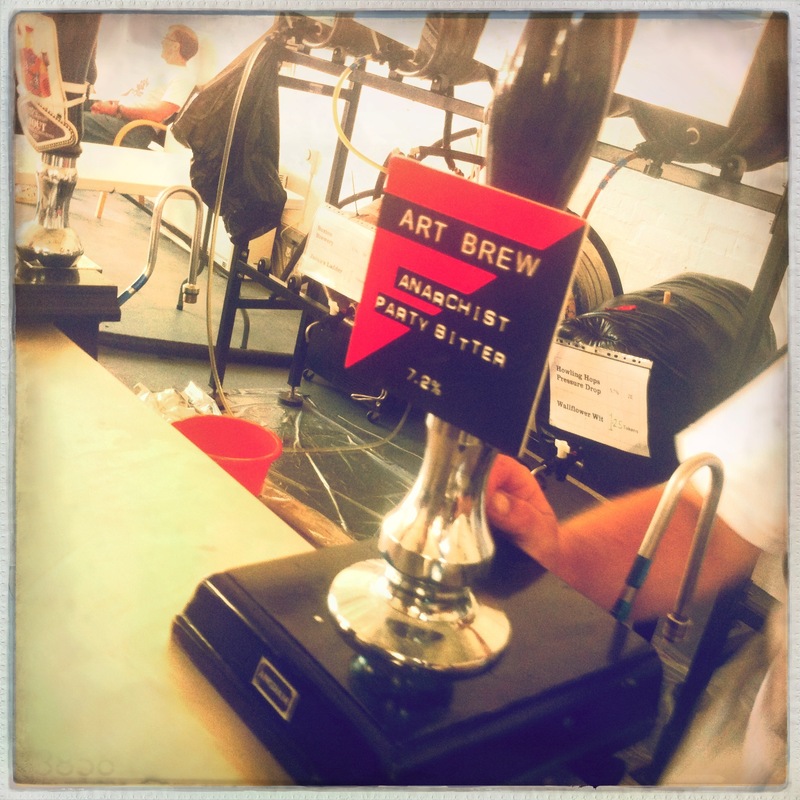 As we were herded towards the exit everyone was beaming, the beer had been good, the venue terrific, and the consensus was that Birmingham Cubed was a huge success. A small posse formed as we wandered across Birmingham to Brew Dog for a final drink before catching the train home. I introduced Darren to Tactical Nuclear Penguin (38%) which made him smile in a slightly confused way, before grabbing a bottle of Kernel Double Citra (9.8%) and a not particularly good, but much needed burger. We hung out with Jaz and his wife and some of his friends and then reluctantly said our goodbyes. Birmingham is a buzzing, energetic city. It always had been in the past when, many years ago it was the closest big city to where I lived and played host to many of the concerts I used to go to. On the train home we laughed like drains for no other reason than we found the word “Innards” particularly amusing. It was like being our teenage selves again. I jumped off the train in Wellington with a wave to Paul and Darren and wandered warm and happy through the drizzle to my mum’s house. Birmingham Cubed was one hell of a day. Well run, well attended and superbly cool. Thanks to everyone who took the time to come and say hello and talk about CAMRGB and how good beer really can be. I’d just got over the come-down of the normal working week after attending this utterly superb event, only to be reminded of it thanks to your excellent write up!